The atomic spectroscopy market is poised to reach USD 5.60 Billion by 2020, growing at a CAGR of 6.0% during the forecast period of 2015 to 2020. The growth of the overall market can be contributed to rising investments, funds, and grants by government bodies worldwide and technological advancements. In addition, growing food safety concerns and stringent regulations have contributed to market growth. In the coming years, the atomic spectroscopy market is expected to witness the highest growth rate in the Asia-Pacific region, with emphasis on India, China, and Japan. The high growth in India and China can be attributed to rising food safety concerns, emerging biotech industry and conferences that act as a platform for companies to showcase their products and establish business relations. North America is expected to account for the largest share of the global atomic spectroscopy market. However, the dearth of trained professionals and high cost of equipment are likely to restrain the growth of the market during the forecast period. The report segments the market based on technology and applications. The atomic absorption spectroscopy segment is expected to account for the largest share of the market in 2015. However, ICP-MS is expected to grow at highest CAGR due to higher throughput as compared to GFAAS, high linear dynamic range, superior detection capability than ICP-OES, and the ability to obtain isotopic information. 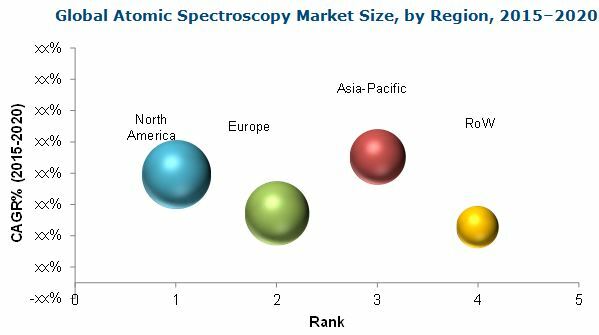 Some of the major players in the global atomic spectroscopy market include Agilent Technologies (U.S.), PerkinElmer (U.S.), Thermo Fisher Scientific (U.S.), and Bruker Corporation (U.S.). The demand for atomic spectroscopy systems has been on the rise due to the burgeoning requirements of the life sciences and pharmaceutical industries as wells as the substantial demand from the chemical and petrochemical industries. Various regulatory authorities across industries have enforced stringent safety regulations in order to ensure that the products launched in the market adhere to quality specifications. The use of atomic spectroscopy technologies facilitate the compliance with these regulations by enabling the measurement and monitoring of the level of metals in samples. The global market is segmented on the basis of technology, application, and region. By technology, the market comprises X-Ray Fluorescence Spectroscopy, Atomic Absorption Spectroscopy, X-Ray Diffraction Spectroscopy, Inductively Coupled Plasma Spectroscopy, Inductively Coupled Plasma-Mass Spectroscopy, Elemental Analyzers, and others. Other atomic spectroscopy market includes Microwave-induced plasma optical emission spectroscopy, glow discharge optical emission spectroscopy, laser spectroscopy, and X-ray photoelectron spectroscopy. In 2015, the atomic absorption spectroscopy segment is estimated to account for the largest share of the market and ICP-MS is expected to grow at the highest rate during the forecast period. On the basis of application, the atomic spectroscopy market is divided food and beverage testing, pharmaceuticals, industrial chemistry, environmental testing, biotechnology, and others. In 2015, the food & beverage segment is expected to account for the largest share of the market and grow at the highest rate. The key factors expected to spur the growth of the atomic spectroscopy market are increased investments, funding, and grants by government bodies worldwide; ongoing new product launches; technological advancements; increase in the number of conferences, which helps to create awareness of the techniques; and growing concerns for food and drug safety. However, the high cost of equipments and the need for highly trained professionals are likely to restrain the growth of this market. Source: U.S. Food and Drug Association (USFDA), World Health Organization (WHO), Centers for Disease Control and Prevention (CDC), The Natural Sciences and Engineering Research Council of Canada (NSERC), Associated Chambers of Commerce and Industry (ASSOCHAM), National Institutes of Health (NIH), Federation of Analytical Chemistry and Spectroscopy Societies, Society for Applied Spectroscopy, Canadian Society for Analytical Sciences and Spectroscopy, Expert Interviews, and MarketsandMarkets Analysis. The major players in this market include Thermo Fisher Scientific, Inc. (U.S.), PerkinElmer, Inc. (U.S.), Agilent Technologies (U.S.), Bruker Corporation (U.S.), Rigaku Corporation (Japan), and Shimadzu Corporation (Japan) among others. 8.2.1.2 Atomic Spectroscopy Conferences, Symposia, & Seminars Hosted By the U.S.